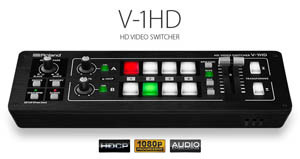 The V-1HD is a compact 4input HDMI switcher with preview and main outs, plus a whole host of handy features in an easy to use package. Connect and switch video cameras, smart phones, computers, tablets, Blu-ray players and other HDMI video sources with a simple push of a button or slide of the T-Fader. Fade to black or white. The V-1HD supports professional compositing effects such as picture-in-picture and keying allowing for graphic insets, titling or even “green screen” ideal for news broadcast or corporate training productions. An easy to use 4 input switcher, with preview and main outputs (all on HDMI) and fade to black or white options. Popular with VJs due to features such as transform, on-board effects, BPM sync and midi.